After a year of monitoring the Isolated Buttress at Harrison's Rocks it was discussed at length again at the Harrison's Rocks Management Group meeting on 19th October. 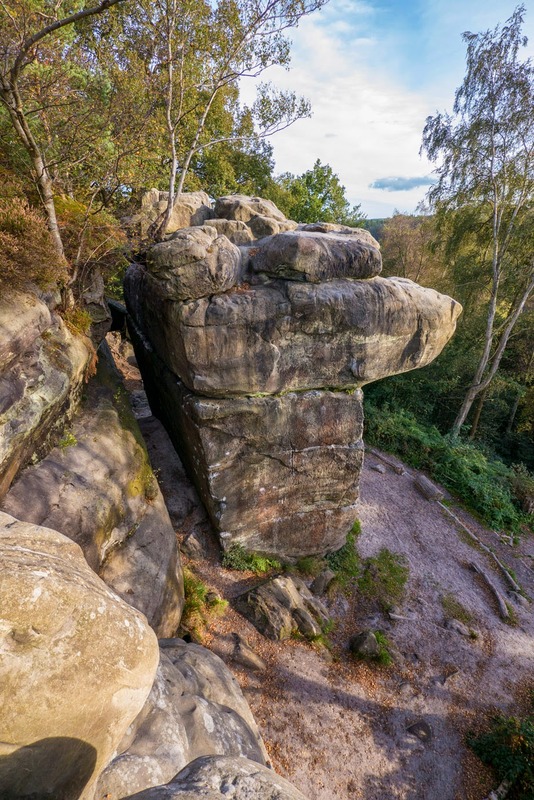 It was recognised that during the the past year, some damage had been done to the rock by climbers heavy use of the traverse across and evidence had been collected of some people abseiling back down. Strong views were expressed regarding building a bridge but once again there were strong arguments on both sides. (See stories at the bottom of this page if you want more background info on Isolated Buttress). Without these ropes being left in place by good-willed climbers, it is hoped it will make those less experienced climbers appreciate the full extent of the access situation to and from the buttress. It would allow climbers to use their own judgment on their own safety. It is thought that with less on-hand guidance and access, this would then give an accurate picture on what the majority of climbers would do to access the buutress. Some arguments against having a bridge were; that having a bridge would lose the sense of 'adventure' of climbing and maybe less people would climb Isolated Buttress if access was difficult, therefore minimising erosion. Some arguments for a bridge were; that it is creating an 'elitist attitude' amongst a minority of climbers. Whilst one member of a climbing group may be confident enough to solo to put a top-rope up for everyone else, other members of the group are not always so confident and want to be lowered back down instead of finding other means to get down, therefore causing erosion to the top of the rock. Also, the traverse and easy climb up is now getting heavily used, and it is now starting to show signs of damage. Where the rock is showing wear and tear, it was suggested that these areas should be treated, if possible before the winter. It is also worth noting that the BMC have deemed the wedged rock to be technically unsafe as a form of access. Also, a sign will be going up to inform climbers to not use the bolts on the buttress for anything other than top-roping. At the end of 2017 the HRMG will have the final decision on whether or not a bridge will be built. If you want your say, please come along to one of the open sandstone meetings in person to air your views. The next meeting will be next spring on Sunday 21st May 2017 and will be advertised here along with the minutes of the previous meetings.